you've found some better place..."
For me, I first stumbled across Everything But The Girl (or EBTG as they're known for short) in the mid-1980s while working overnights at a "smooth jazz/new age" radio station. 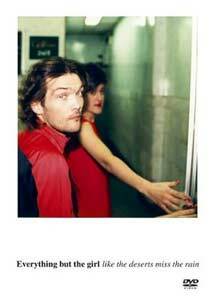 EBTG didn't exactly match the format requirements of the station 100%, but the English duo of Tracey Thorn and Ben Watt put out a string of consistently hip and mellow acoustic music, all centered around Thorn's vaguely jazz club/chanteuse vocal stylings. Debuting in 1984, the pair's laid-back approach never achieved major notoriety in the States, despite a loyal following in their native England. Their career was sidetracked—make that nearly obliterated—in the early 1990s when Watt contracted a near-fatal illness (chronicled beautifully in his book Patient: The True Story of a Rare Illness), and on the upswing they eventually morphed into a new phase of their career as some type of neo-techno outfit, buffered by a series of gently thumping club remixes of some of their earlier works. Though the band has not, to the best of my knowledge, issued an album of new material since 1999, thriving as they are on the trendy remix market, Warner has stepped up and issued Like the Deserts Miss the Rain, which is a cross-section of videos, live performances, and even a few unreleased demos. Taking its title from a line from their song Missing, likely their biggest hit, this collection is a pastiche of material from various points in their discography. Thorn possesses a wonderfully restrained, full-bodied voice, and Watt, a successful club DJ and multi-instrumentalist, does a fine job of complimenting her with his almost anonymous soft vocals, and together EBTG sometimes seems like they're unfortunately adrift somewhere inbetween any kind of distinctly identifiable genre. The core of the content presented here is geared mostly around nine of their rarely seen videos, starting off with a Todd Terry remix of easily their most mainstream song, Missing. Visually, it's not the most innovative track you'll ever see (typical girl loses boy stuff), but in this case the actual remix is what it's all about; the mildly revitalized rhythm track transforms the song from a sleepy ballad into a hypnotically moody bit of dance music, and is indicative of their current metamorphosis. Overall the mood is slow and rhythmic, from cuts like the pulsating Temperamental, and its manic sped up audition-frenzy storyline, to the gentle acoustics of their cover of Simon and Garfunkel's The Only Living Boy in New York, which becomes a lazier Watts-dominated track featuring a bit of loosely interpretive sign language. Earlier hits like Driving and Love Is Where I Live are included, as well as their later dabblings in the electronica realm. The live tracks are made up of three songs (Before Today, Temperamental, Protection) recorded during a performance at The Forum in London, 1999, and while Thorn is on her game vocally, it is Watt—hunkered down over a set of keyboards—who is somehow really the focal point as he reveals himself to be the svengali bandleader. For their deep catalog of material, strangely enough Warner gives us yet another version of Temperamental (the song appears a total of three times on this disc), one that isn't that different than the studio version found in the video section. Regardless, the live EBTG performances (backed by bassist John MacKenzie and drummer Martin Ditcham) are impressive, the crowd enthusiastic, and it left me wishing more footage of The Forum show had been included. While EBTG seem to be one of those groups permanently caught between categories, it doesn't make this mini retrospective any less enjoyable. Image Transfer Review: Most of the material is presented in 1.33:1 full frame (aside from a couple of nonanamorphic widescreen videos), and image quality is all over the map on this one. Some of it can certainly be chalked up to intentional artiness on the part of EBTG, with things like grain and oversaturation, but some of the imperfections (edge enhancement and shimmer) seem to be just that—imperfections. The live segment is poorly lit, and suffers from smeary coloring, blocky reds, and heavy grain. Audio Transfer Review: Audio is provided in Dolby Digital 2.0 stereo, and while I might ordinarily bemoan the lack of a proper 5.1 mix on a music disc, I have to say the presentation here is nicely done. Thorn's voice sounds crisp, and the instrumentation is equally clean. Bass response could have been a bit deeper to accent those club beats, but I was still mildly pleased by the richness of the bottom end. Extras Review: Extras consist of three unreleased demo recordings that are played over a series of EBTG photo slideshow, sort of like accompaniment to a scrapbook. The tracks are Frozen River (recorded at their home in 1991), Mirrorball (recorded in New York in 1995) and Flipside (recorded at their home in 1995). The photos are nothing remarkable, but getting the three unreleased demos is a nice treat. There is also something called an Interactive Video Mix segment that allows you to mix-and-match four different sets of film footage (using the Camera Angle button on your remote) to create a music video, all set to Pull's Timewarp mix of Temperamental, here slowed down slightly in tempo and stretched out to six minutes. I'm not much for the busy work of mixing and matching, but I do like the remix of the song. There are 12 chapter stops, and no subtitle options. This one may not necessarily jump off the shelves, but Warner has issued this nice mix of videos and live footage at a modest price (less than the price of a single CD), so it is an easy recommendation for fans.